For most of you back in the USA or other parts of North and South America, you haven’t even opened up your first booster pack yet. 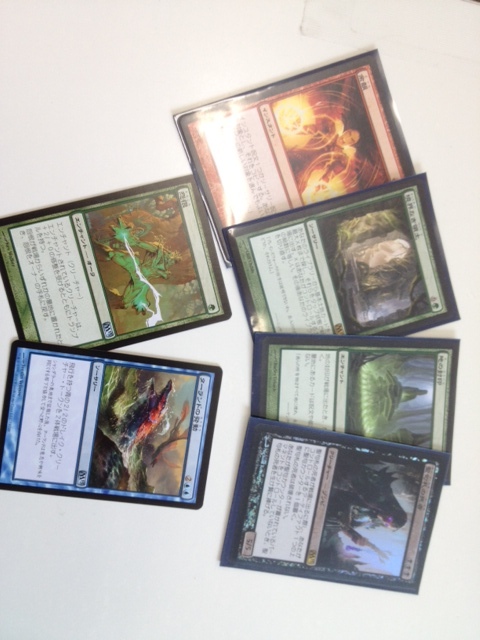 However, I have just completed my first pre-release tournament (I’ll be doing another one tomorrow). I felt really good after opening my packs. About 34 people showed up at Card Brunch and were ready to get at it. 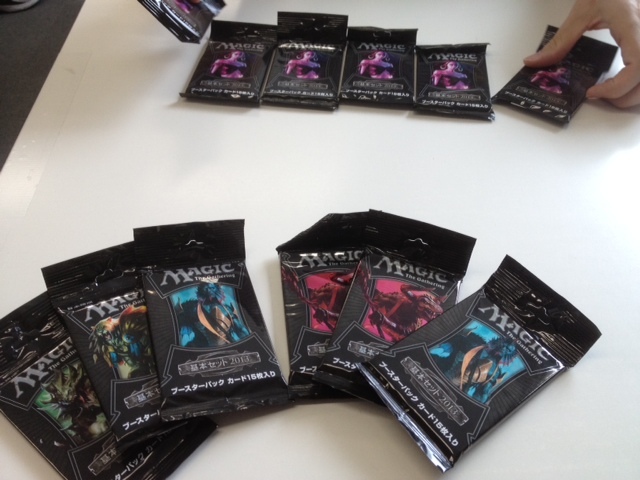 My friend Kamiken had decided to choose all Liliana boosters and pulled a lot of MEH cards. I on the other hand was a bit more fortunate. I eventually decided to use a WB deck based around Exalted. The cards I ended up not using were Reverberate, Rancor, Talrand’s Invocation, Phylactery Lich (though I think he’d be awesome in a UB Tezzeret deck), Boundless Relams, and Ground Seal. Blue, Green, and red ended up being a mix bag for me. I could have made a decent UB or UW Deck, but decided to go with WB instead. Take a look at the picture below and you’ll see why I went with white and black. My black and white cards were pretty freakin awesome. Sublime Angel, Liliana of the Dark Realms, 2 Tormented Souls, Odric’s Crusader, Captain’s Call, 2 Knight of Glory, Griffin Protector, 2 Aven Squire, Bloodhunter Bat, and 2 Vile Rebirth to name most of them. I also managed to get a Trading Post, which was very useful later on in the game to keep my life total up there in mirror matches. I trounced my first opponent pretty easily, taking him out in about 20 minutes by winning 2 straight games, but after that it was all downhill. I finished the day 1-4, and I couldn’t be more angry. I was mana flooded one game, had to mulligan twice in another, and there were tons of mirror matches. 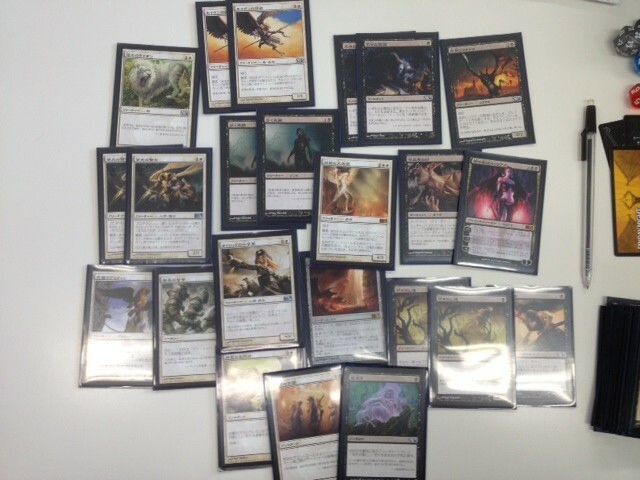 White and Black exalted was definitely the most popular build during pre-release. I just wasn’t able to match the other players in card removal, and that was my downfall. The only removal I had was Divine Verdict. My curve was pretty damn awesome actually. I’d lay down a Tormented Soul T1, a Knight of Glory on T2, another exalted creature or Odric’s Crusader on T3, and by turn 4 I could usually cast Liliana, Sublime Angel, or Captain’s Call to beef up the Crusader for a heavy hit. So how did I end up going 1-4 with these cards? Well, I’ll show you why. 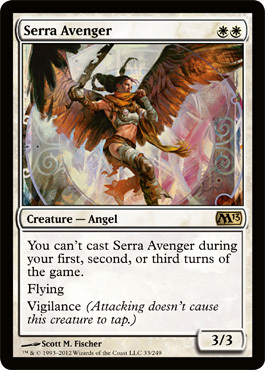 This card absolutely destroyed me, especially once I put my Sublime Angel on the table along with my army of tokens. This is the best board wipe in M13 pre-release I think. Everybody’s deck was creature heavy, with some better than others, but once this hits the table you’re screwed. To a lesser extent I was taken out by Pacifism, Murder, and Divine Verdict, but this card was by far the thorn in my side. There were about 3 players I played against that used it. Keep this in mind when you play, and be careful not to put all of your eggs in one basket. Hold back one or two of your cards if your opponent is running black that you can use as a trump card if things go bad. That’s my advice. 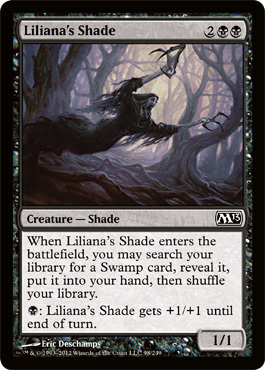 Another card that kinda slipped under the radar but I saw to be pretty useful in a sealed tourney was Liliana’s Shade. 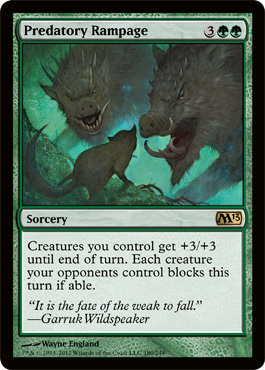 Like any other shade it’s pumpable, and you’d think that costing 4 would be a turn off for some people, but being able to search for a swamp came in hand on more than one occasion, and with limited forms of removal, by next turn this could be AT least a 4/4 if unblocked. Not bad in a 4 cost spot if you’re playing black. At one point I decided to switch my black out for blue (bad idea, I lost), but I got to play with Courtly Provocateur and it’s actually damn effective with Exalted. By making them attack with a creature into your bigger creature, or forcing a creature to block your beefy Exalted or deathtouch creature, you can easily gain numbers over their side and take them out. If you have decent blue pulls and some good quality white or black Exalted creatures, I’d recommend trying this out. Yeah, Thragtusk was pretty nasty. I saw him later in the game, when I was about to attack for the kill against my opponent, and the 5 life put the game just out of reach for me. He ended it on the next turn with Thragtusk and another big green creature. Not sure how many people pulled him from a pack though. This card was very powerful in sealed. There weren’t many 3 power flyers (I only had Sublime Angel and 2 Aven Squire’s myself), and with Exalted this card become really good. And because it has vigilance it could also take on your attackers. Great card to use. 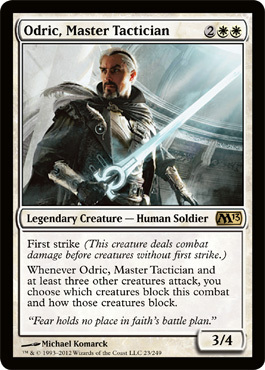 The only time I saw Odric was when I tried out my blue/white Token Exalted deck, and I ended up using Switcheroo to exchange my Goat for his Odric. Wasn’t able to use his ability at all, but his first strike was great to have. Can’t say much else about how useful he is in sealed. Probably depends on how many token producers or small creatures you have. Saw two of these in play, and they were pretty useful. They’ll work in any color, even ones without Exalted like Green or Red, so I’d say this is definitely worth having in your deck. I didn’t have any experience against a red deck, but my friend came up against a Krenko deck and this card destroyed him. 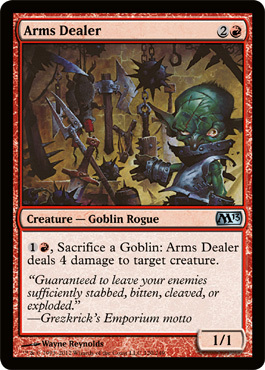 With Krenko in play, he could tap him and add 2 Goblins, then use those Goblins as bombs to take out any creature my friend put on the table. If you have some good red cards and Krenko, definitely think of this combo when making your deck. 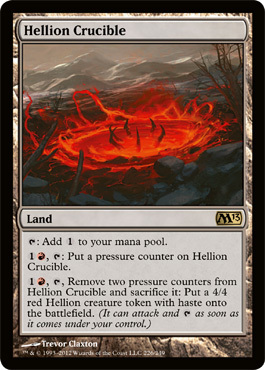 Again, I didn’t play against the red deck, but it also had Hellion Crucible and when my friend played against it (and lost) he said that Hellion Crucible was pretty powerful. You can keep those counters on it and wait until all other creatures are dead (from a board wipe or a removal spell), then pop those counters off of him and attack. You can also use it as a blocker at instant speed if your opponent isn’t paying attention and attacks carelessly. I’d definitely use this card if your opponent has a lot of removal. And that’s how my first day ended. I’m excited about the cards I got but really disappointed with my performance. I was right that most people would be using WB Exalted decks, but I really didn’t prepare an adequate response to the mirror match against another WB Exalted deck. How should you approach making your deck? Well, an exalted deck would be great, but everybody else will be using those as well. If you can find an appropriate counter to Exalted (removal), or if you can put together a deck that is effective against exalted as well as other decks being used (like the UW or UB control mill decks I was talking about), then you’ll be in good shape. Good luck to you this weekend, and if you have the time stop by and let me know what worked and what didn’t work for you! Your deck looks remarkably similar to the one I played at my local pre-release; WB exalted w/Sublime Archangel though I was luckier with my removal suite (2 Divine Verdict, 2 Crippling Blight, Staff of Nin and Chandra). You were right about exalted. It’s so fast and I was ussually able to dominate the early game. Vampire Nighthawk is really good when supported by Exalted. I had the same problem playing against Thragtusk. That 10 life (rise from the grave) bought my opponent enough time to stablise and win. Your build-up articles really helped when I was deck building on saturday. Thanks! Glad you found them useful! What other good rares did you get? Clone, Stormtide Leviathan and Diabolic Revelation. Didn’t have enough blue cards to make use of the first two.